Los Angeles, CA (February 24, 2019) – The 91st Academy Awards saw the world’s biggest rock band own Hollywood’s biggest night. Legendary rock band QUEEN + Adam Lambert opened—and stole—the show at the star-studded Oscars, performing a medley of two of their most iconic songs, “We Will Rock You” and “We Are The Champions,” getting a much-deserved standing ovation from Tinseltown’s elite. Watch their electrifying tour de force HERE. QUEEN, who were recently the No. 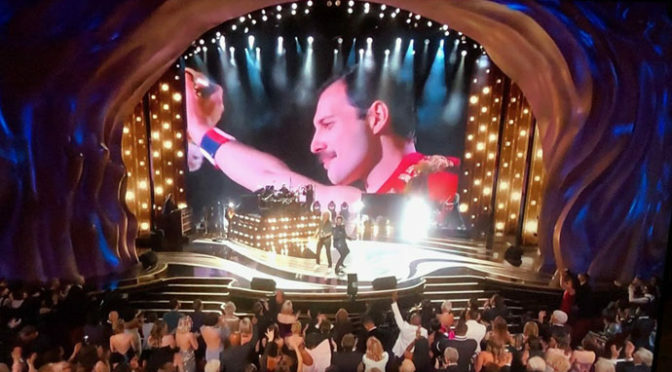 1 streamed artist on Spotify, was celebrating the Oscar nomination and blockbuster success of the award-winning 20th Century Fox film, Bohemian Rhapsody, a tribute to the band’s enduring legacy and their extraordinary lead singer Freddie Mercury, who defied stereotypes and convention to become one of history’s most beloved entertainers. Bohemian Rhapsody is the highest-grossing biopic of all time and the fifth top-grossing release of all time for Fox. The legendary “Bohemian Rhapsody” single, regularly cited as one of the greatest songs ever recorded, was recentlyrecognized as the world’s most-streamed song from the 20th Century, as well as the most-streamed Classic Rock song of all time. “Bohemian Rhapsody” hit No. 1 on the iTunes Rock Chart and No. 10 on Spotify’s Global Top Songs Chart and has been on that chart every week since the film’s release. QUEEN original band members Brian May and Roger Taylor will team up once more with vocalist Adam Lambert for the Rhapsody tour, an epic 25-date run from mid-July through late August. The North American headline tour will be produced by Live Nation. After blowing everyone away on the eighth season of American Idol, Adam Lambert went on to release his debut album For Your Entertainment which included the international hit “Whatya Want From Me” and earned him a Grammy Award nomination. Adam followed this success with his second album Trespassing which became the first album to reach the number one spot in the US and Canada by an openly gay artist. His highly anticipated third album The Original High was executive produced by Max Martin and Shellback and included the smash hit “Ghost Town.” Adam joined the cast of Glee for a six-episode story in 2013 and performed the role of Eddie in Fox’s The Rocky Horror Picture Show. He went on to judge on The X Factor Australia where his artist, Isaiah, won the show. 2019 will see Adam releasing his fourth album, and also exploring the world of film, voicing character Emperor Maximus in upcoming animated-live action hybrid movie Playmobil: The Movie. His new song “Feel Something” came out on February 22nd. Click here for full tour itinerary.